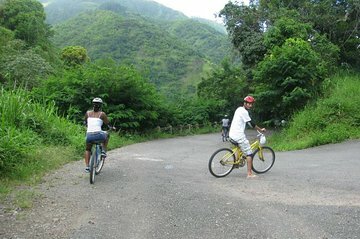 Recorre las famosas Montañas Azules de Jamaica durante esta aventura ecológica de 10 horas desde Kingston. Disfrute de un paseo panorámico y relajante hacia las montañas, luego comience su descenso desde una alta elevación hacia abajo a través del exuberante bosque de montaña. Vea los campos donde se cultiva y cosecha el famoso café Blue Mountain, luego refrésquese con un baño en una de las prístinas cascadas de la zona. Brunch, almuerzo, todo el equipo y transporte de ida y vuelta desde Kingston están incluidos. The ride was very easy and quite good organised, there was quite bits to see on the road and downhill ride was easy. Both breakfast and lunch are at reasonable good quality. Two of us booked this tour and thought it maybe a tour in a small group. However it was a group of around 50 people with around 8 guides. There was a brief session of showing coffee roasting and coffee trees. However I would not suggest to use this to instead any tour in a proper coffee estate. The main negative thing was in the group of 50, only 2 of us from kingston. We been picked up from hotel and take long way to drove to Annotto Bay at north coast to meet the rest of the group, who are mainly Ocho Rios, then joined their bus to re-enter the blue mountain from North. The driver who picked up us was nice and waited us at Annotto Bay while we are with the main group. Although the website suggested the tour is around 8-hours, we were on bicycle for only 2 hours. All the rest were on the road of commuting.